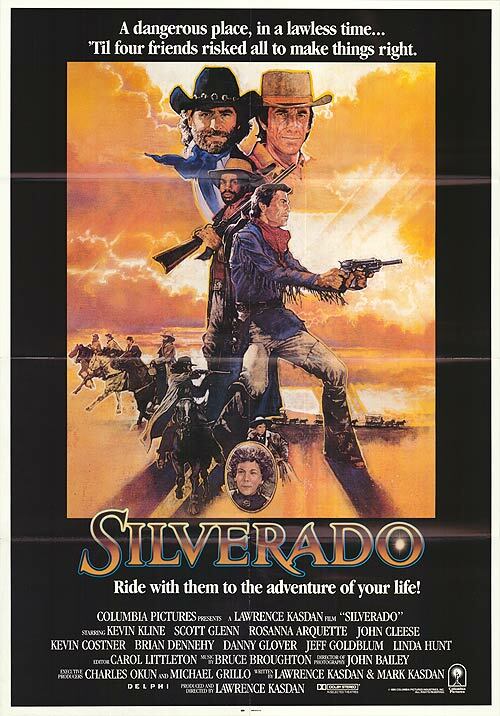 They never say in the film Silverado that it takes place in New Mexico. From the dialogue one only knows it's set in the mythic, generic Old West, a way stop between the East and California. But if you've been to New Mexico you don't have to wait for the end credits that state the film was filmed in its entirety in the state; it's self-evident. 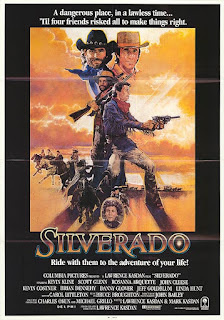 Lawrence Kasdan (who wrote the screenplays for Raiders of the Lost Ark and The Empire Strikes Back) wrote and directed this story of two brothers (played by Scott Glenn and an unusually playful Kevin Costner) join up with a saloon keeper (Kevin Kline) and an expert rifleman (Danny Glover) to save a small town from an evil cattle baron. The film sits awkwardly in the category of Movie Churches because though there is, indeed, a church in the film, it's only a structure. A church sits on the edge of town and is often seen, but we never see the interior of the church and never hear mention of clergy or a worship service. The church is only mentioned as a place of meeting. (And as Admiral Ackbar says, "It's a trap!") There is no talk of God or spirituality, but in the tradition of the genre, there is good and evil, and the good wins out. Many other westerns have been set and/or filmed in New Mexico. Because Billy the Kid robbed and died here, the state can claim The Left Handed Gun with Paul Newman, The Outlaw with Jane Russell, and Pat Garrett and Billy the Kid with Bob Dylan. The Western comedy City Slickers was set and filmed in New Mexico, as was the Western science fiction film, Cowboys and Aliens. When not set in Asgard, much of Thor takes place in New Mexico. The giant ants of Them! are discovered in New Mexico. Jeff Bridges won his Oscar for playing a country singer in Crazy Heart, which is set and filmed in New Mexico. Billy Wilder made one of his most cynical films (and that's saying something) in New Mexico: in Ace in the Hole, Kirk Douglas plays a reporter who can't give up his story of a man trapped in a mine, so he finds ways to delay the rescue. There are many others, but I'll quit with what seems a timely mention of The Man Who Fell to Earth -- which proved without a doubt that David Bowie was not of this earth. But he might have been of New Mexico. In Albuquerque, New Mexico we went to a wonderful theater to see an awful film. The Icon Cinemas offer a choice of vibrating and reclining seats. You choose your exact seat from a chart at the box office. On the day we visited, it was a discount day and the popcorn was all you can eat as the sodas were all you could drink. So it was a quite pleasant experience, except for the film. I won't dignify the film by mentioning it by name. But I will say it answered the question that no one was asking, "What would happen if you cast a crass teen comedy with middle aged sitcom stars?" The answer to that question is not pleasant. Speaking of Jeff Bridges, the remake of True Grit was largely filmed in NM.